Farmer Rawle Medford was all smiles yesterday after successfully harvesting – for a second time – a batch of onions from his Phillipi Village, East Berbice-Corentyne. This was in collaboration with the National Agricultural Research and Extension Institute as part of the Ministry of Agriculture diversification programme. Guyana Standard understands that the progamme targets crops that are imported but can be grown locally in an effort to reduce imports and save on foreign exchange. 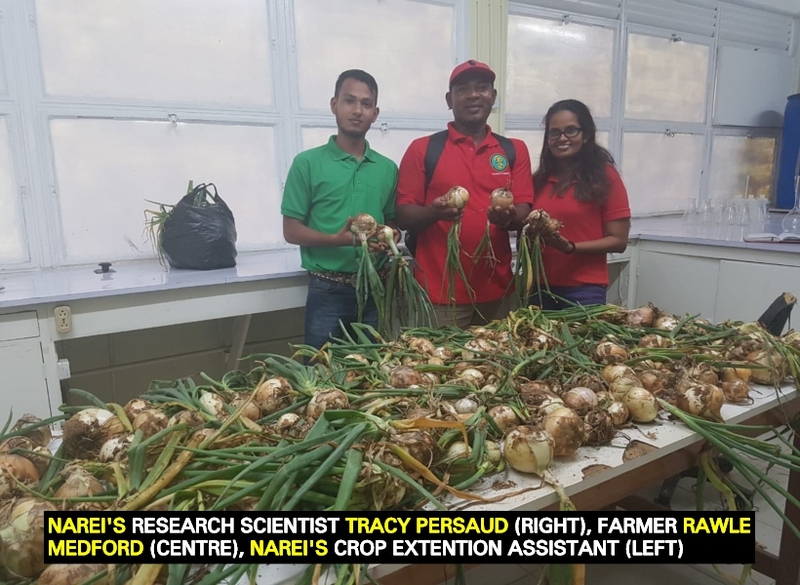 The objective is to test tropical varieties of red and white onions that are adaptable to Guyana’s climatic conditions and soil types and recommend suitable varieties for commercial production. NAREI provided the planting materials and technical support through the institute’s Research Scientist, Tracy Persaud and team. The 43 year old farmer was among those who received training in onion cultivation from Promotion of Regional Opportunities for Produce through Enterprise and Linkages (PROPEL) and National Agricultural Research and Extension Institute (NAREI) last year. Rawle, who has been a farmer all his life – investing in mostly watermelon, sweet pepper and boulanger, now plans to include onions to his line of crops since there is already a lucrative market available. The young farmer has been successful in both of his trials. He harvested 450 pounds (204 kg) of onions (Mercedes and Superex varieties) in 2018 and supplied his produce to local supermarkets. A few days ago 114 pounds (52 kg) of fresh onions – varieties Texas Early Grano, Yellow F1 Granex and Red Creole were harvested. These onions were harvested four months after transplanting. Based on the yield obtained, the production efficiency is on par with established onion producers. Another set of onion seedlings will be transplanted next week. This effort is being replicated in administrative regions 2, 3, 4, 5, 6 and 10 and scaled up to larger acreages.